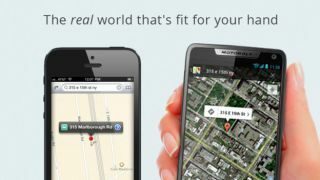 Google has used its Motorola smartphone brand to poke fun at the ongoing Apple Maps debacle. A new advertisement for the Motorola Droid Razr M depicts the smartphone next to the iPhone 5. The Android device shows Google Maps while the Apple smartphone features the new Maps app on screen. While the Razr M displays a detailed satellite image of 315 E 15th Street in downtown Manhattan in Google Maps, the iPhone 5 with Maps shows the same street, appearing as an almost barren stretch of road. The Motorola Mobility Twitter account posted the posted the ad late on Friday, while the Maps mess was busy overshadowing iPhone 5 launch day. Moto has continued to push the #iLost hashtag in tweets since. Google, of course, will probably be feeling pretty smug right now; like a jilted lover who's just seen their ex arm-in-arm with a dramatically less desirable new partner. Google Maps was shelved by Apple for a homegrown solution for iOS 6. Apple has pleaded for patience as as it seeks to improve the new tech with the addition of user data.